It’s been a year since I released the Saving for Disney course and it is time to celebrate! Enter the code ANNIVERSARY or ARIEL to purchase the Saving for Disney Course for just $19.99! Are you dreaming of a Walt Disney World vacation but you just don’t have $3500 right now? Are you tired of missing out on Disney memories with your children who just keeping getting older? Are you looking to save more money on the things you already buy? Are you ready to stop wishing and start doing? If you are ready to visit Walt Disney World, you’ve got to start a savings strategy today. *Learn how to put your family on a budget with easy to use worksheets. *Learn how to organize your coupons, track your stockpile and save on all of your everyday purchases. *Learn how to utilize your savings to pay for a Disney vacation without tapping into your family’s monthly income. I’ll teach you everything you need to know to save for a Disney vacation! Enter the code ANNIVERSARY to purchase the Saving for Disney Course for just $19.99! Can I use this course if I don’t purchase convenience foods? There are resources for saving on produce, meat, dairy, household goods, dining out, gas, prescriptions and a whole lot more! It teaches you how to be a realistic couponer….not an extreme couponer. Does this course include updated worksheets for 2017? It sure does! In fact, none of the worksheets or eBooks are dated. 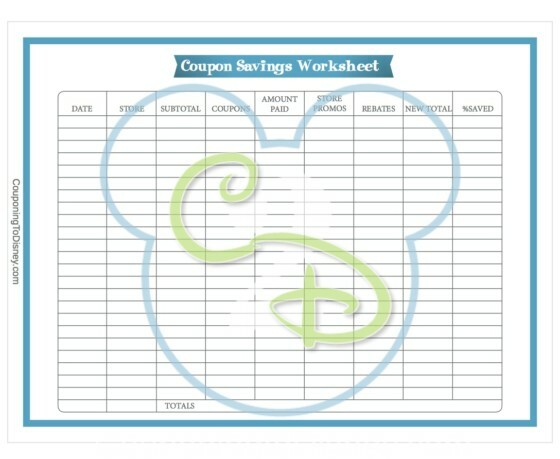 When you purchase it today, you can use the worksheets year after year. I am an experienced couponer, will I be able to save more than I already do? This course utilizes strategies that many people don’t consider, even the most experienced of couponers. I have had numerous people tell me how much they learned even though they have been following my blog for 7+ years! I don’t have time for coupons. Is this course still helpful? This course teaches you the strategy to save for Disney. Coupons are just one aspect of this. There are also tips on budgeting, stockpiling, saving on everyday expenses and how to earn cash for your Disney fund. Why you need a Disney vacation. We fell in love with Walt Disney World when we first visited in May of 2009 and again when we returned in May of 2010. Later that year, my oldest daughter almost died from Appendicitis. When she was in the hospital I remember thinking how grateful I was for the Disney memories. She made a full recovery and we celebrated by going to Walt Disney World. How fitting! My goal is to help every single family create memories with their loved ones. Memories are the most cherished gift you can give another person and Walt Disney World is a place where both adults and children can have fun together. I have successfully couponed to 5 different Disney World Vacations and we are working on our sixth! *How to create a budget including worksheets for tracking pay dates, bills and expenses. *How to tackle your debt while saving for Disney at the same time. *How to budget for upcoming and unexpected expenses and income. *How to save for Christmas and birthday gifts. *How to find money in your budget and stretch it further. *How to save on the bills and expenses you already have. *How to find and organize coupons so you don’t forget to use them at the store. *How to plan dinners that keep your family out of the fast food line. *How to shop at national stores and save even more than you already are. *How to grow your stockpile and keep track of the items you have. *How to lower your food expenses with ways other than coupons. *How to save on dining out, gas, entertainment and other necessary expenses. *How to save on gift card purchases and get paid to shop online. *How to earn money for your Disney fund with tips, tricks and strategies. Best of all, you’ll be able to create more memories with your loved ones that you will cherish for the rest of your life. What Is In The Saving For Disney Course? 33 page printable Couponing Binder – helps you organize your coupons, track your purchases and save as much as possible on your family’s food bill. Remember the more you save on food, the more you have for Disney! 33 page printable Budget Binder – contains everything you need to keep your family’s finances on track. These pages will help you set up a realistic budget for your family, track upcoming expenses, pay down your debt and save for your Disney vacation! 50 page Budget E-Book – Learn how to budget your way to Disney. This E-Book includes budgeting tips and instructions for the budget binder that will help keep you on track. 9 page Couponing Binder E-Book – Take couponing a step further with this Couponing Binder E-Book. It is filled with secret shopping tips to help you save for Disney. 63 page Couponing E-Book – Learn how to coupon your way to Disney with this all-inclusive book. It includes everything that I know about saving money on groceries, health and beauty items, household goods, baby supplies and lots more! It has tips and advice for everything you buy at the grocery store each week. 32 page Save On Your Weekly Allowances E-Book – Learn how to cut back on everyday expenses including entertainment, auto, and non-food purchases. 33 page Grow Your Disney Fund E-Book – Learn how to turn savings and store gift cards into cash for your Disney vacation. You’ll also learn how to earn extra income from home including cash back programs, Rewards programs and selling unwanted household items. This course is designed with every reader in mind. No mater your current eating habits, lifestyle or financial situation, you will find tips and advice in this course to help you save money and budget better. 10% Of The Sale Of The Course Goes Towards Helping Families Get To Disney! When my daughter came very close in 2010 to losing her life to appendicitis, I realized in that moment just how cherished our vacation memories were. I want every parent to have those memories with their child. From those feelings and love, the Saving for Disney course was born. 10% of the purchase of every course goes to Give Kids The World! It is a 79-acre, non-profit storybook resort located near Central Florida’s most beloved attractions where children with life threatening illnesses and their families are treated to a weeklong, cost-free vacations. Track your coupon savings for the month including your subtotal before coupons and after. It’s always fun to see just how much you can save each month. Plan out your menu for the week and instead of assigning a day of the week, you assign a number. Pick each night what your family is in the mood for. You’ll already know you have all the ingredients on hand. Don’t coupon without a purpose. This worksheet helps you keep track of how much you have of each item in your stockpile. Once you have a 6 month supply, move on to the next item! Couponing and saving money can be time consuming. Make yourself a schedule each week of everything you want to get done with coupon savings, app earnings and other goals. It is helpful to breakdown how much you need to save into smaller, manageable pieces. This worksheet has 365 boxes and you can fill it in with any set amount you’d like. Aim to save/earn that much everyday and you’ll have your trip paid for in 12 months. Breakdown what you earn, what bills you pay and what expenses you have for each paycheck. One worksheet that the readers have requested the most is one that can be used to track your app earnings. I spent some time designing one that I think will be perfect and help you to stay on track. Each copy of the worksheet can track the earnings of 5 different apps. Simply write in the name of the app on the left hand side and the goal for the month on the right hand side. Each day fill in the amount you have earned under the date for that day. At the end of the month, tally up your total for each app as well as the grand total for all 5 apps on the page. Are you ready to start Saving for Disney today? Click here to learn about my other course…the Walt Disney World Planning Digest!